Marriage 1899 Charlotte P was married to John E Morgan in 1899 at Yass, NSW, AustraliaG. Married Name 1899 As of 1899, her married name was Charlotte P Morgan. 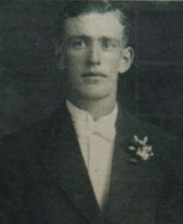 Birth 1890 Harold J Clements was born in 1890 at Blayney, NSW, AustraliaG. Marriage 1921 Harold J was married to Charlotte Armstrong Perks, daughter of John George Perks and Alice Maud Tolhurst, in 1921 at Parkes, NSW, AustraliaG. 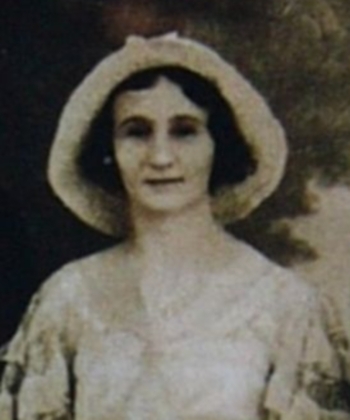 Gladys Amy Perks, née Robinson. Photograph provided by Pat Sprigings. Marriage 1933 Gladys Amy was married to William Porter Perks, son of John George Perks and Alice Maud Tolhurst, in 1933 at Orange, NSW, AustraliaG. Burial October 1979 She was buried in October 1979 at Parkes Town Cemetery, Methodist Section, Parkes, NSW, AustraliaG. Married Name 1933 As of 1933, her married name was Perks. [S840] Pat Sprigings, "Alice Maude Perks, née Tolhurst," e-mail to Robert Mote, August 2009. Theresa Agnes Perks, née Murphy. 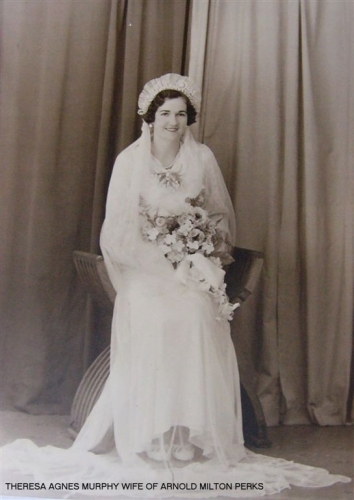 Birth 1917 Theresa Agnes Murphy was born in 1917 at Wellington, NSW, AustraliaG. Marriage 1937 Theresa Agnes was married to Arnold Milton Perks, son of John George Perks and Alice Maud Tolhurst, in 1937 at Parkes, NSW, AustraliaG. Burial 30 April 1977 She was buried on 30 April 1977 at the Cemetery, Ayr, QLD, AustraliaG. Married Name 1937 As of 1937, her married name was Perks. [S408] David Kenneth Sprigings, "A M Perks Family," e-mail to Robert Mote, 8 September 2003. Marriage John (Jack) Gifford was married to Sadie Gwyn Bellis.